How do you define a volunteer? Someone who cares enough about their community to donate their time and talents to make a real difference in the lives of others. For nurses, dedicating time and talents in an effort to better the lives of others and their surrounding communities is their passion, what drives them, and what drew them to the profession in the first place. It comes as no surprise, then, to discover a nurse who decided to volunteer her time and talents outside the clinical environment and the classroom to continue the advancement of nursing across the globe, specifically through the promotion of world health and equity for all. 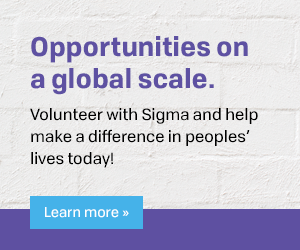 Catherine Best, a Queen’s Nurse, Nursing Lecturer at the University of Bradford, and member of Sigma’s Phi Mu Chapter began volunteering to further hone her leadership skills and allow her voice to be one of those shaping the profession. Catherine is also currently involved in a pilot leadership program within Phi Mu Chapter ― an Action Learning Set, facilitated by the past chapter president, Elizabeth Rosser, the aim of which is to further develop professional leadership of its members within nursing. The year-long program meets virtually each month. Each member of the group commits to supporting their colleagues to achieve their objectives, while maximizing their own achievements. Catherine has had the unique experience of working in both the field of occupational health and nurse education, but it’s the ever-changing face of nurse education that has her most excited. “Nurse education is expanding by leaps and bounds. The skills taught are those that would once have been the sole domain of the physician. That’s just amazing.” Included in the role expansion is the recognition of nurses and their contribution to the field and the increased focus on the importance of nursing voices in leadership. This is one of the largest reasons that Catherine has decided to add ‘volunteer’ to her list of duties as a nurse (something she’s been doing since the early 1990s). She cites her role as the recently-appointed Chair of The Yorkshire and Humber Regional Board of the Royal College of Nursing (RCN) as one example: “This role allows me to represent nursing at a higher level. I can better influence the role of the RCN and speak out about the issues that matter to nurses, and therefore, patient care.” In fact, Catherine’s dedication and commitment to delivering high standards of patient care and continually improving professional practice earned her the Queen’s Nurse Title from the Queen’s Nursing Institute (QNI) in 2012 and gave her another opportunity to use her voice to empower other nurses and continually advance the nursing field. She is now a regular blogger for QNI and uses her voice to bring leadership and guidance on issues that are incredibly important to nurses spanning the globe.